Though tomatoes (Lycopersicon esculentum) are grown for their fruit, not their foliage, yellowing leaves should cause concern. Usually grown as annuals, tomato plants are susceptible to many diseases. Some harm only leaves, but others threaten the fruit. Causes vary, but symptoms may look and act the same. Proper care, good maintenance and quick intervention can help keep leaves green and tomatoes productive. Fungal leaf spots often cause yellowing tomato leaves. Septoria leaf spot (Septoria lycopersici) starts with small, tan-centered, dark spots. The scattered spots grow and yellow, starting with the lowest, oldest leaves and working up. Fruits are unaffected. Early blight disease (Alternaria solani), also known as alternaria leaf spot, moves the same way with dark, target-shaped spots encircled in yellow. The yellow part grows until entire leaves drop, leaving fruit overexposed to the sun. 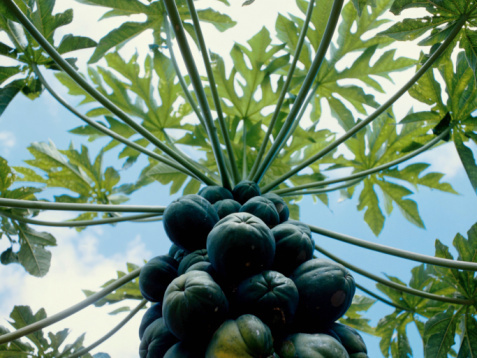 These diseases often strike together and quicken once fruit sets. Treat with ready-to-use liquid copper fungicide. Start two weeks before diseases normally affect your garden or as soon as symptoms arise. Spray all surfaces thoroughly, and repeat every seven to 10 days. Wear protective clothing and goggles when you spray. Easily mistaken for fungal leaf spots, bacterial spot (Xanthomonas campestris pv. vesicatoria) starts with small, greasy lesions -- without tan centers -- encircled by yellow halos that grow together. Bacterial speck (Pseudomonas syringae pv. tomato) looks and acts similarly. Both affect tomato fruit and overwinter in plant debris. Wet foliage hastens the progress of these diseases. Treat with liquid copper fungicide as with leaf spots. Bacterial canker (Clavibacter michiganensis) starts with brown leaf margins lined with yellow and then green leaf centers. It moves up one side of the plant. The yellow leaves stay attached and leaf stems stay green. Plants affected with bacterial canker should be pulled up and destroyed. Tomato plants are affected by many different viral diseases that vary throughout the country. Symptoms include yellowing leaves, ring spots and yellow-green mosaic patterns that mar foliage and fruits. Viruses are spread by piercing and sucking insects, such as aphids, thrips and leafhoppers. While viruses can't be cured, controlling the insects limits the spread to other plants. A blast of water from a hose may dislodge these invaders, and stragglers treated with ready-to-use insecticidal soap. Spray plant surfaces thoroughly because the soap must cover the insects to be effective. Repeat weekly or every other week, until the insects are gone. Fungal diseases in the soil also cause yellow leaves. Fusarium wilt (Fusarium oxysporum lycopersici) affects one side of the plant or leaf, starting first with older, bottom leaves, as leaf spots do. As the plant's vascular system becomes plugged, the leaves yellow, brown and drop. Growth is stunted and fruit doesn't set. Cut stems show brown staining in the vascular pathways near the soil. Verticillium wilts (Verticillium spp.) are similar, but don't stick to one side. The plant's leaves rapidly yellow. If wilt disease is present, no fungicide will help. Avoid planting tomatoes or any related plants in that area for at least four years. Tomato diseases are difficult to treat and eradicate once they take hold. Prevention is an easier route. 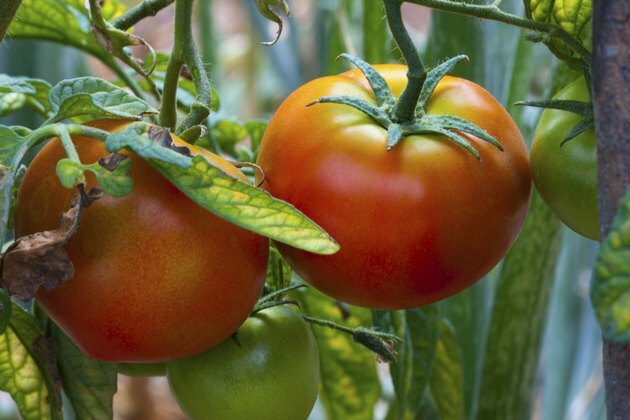 Plant disease-resistant varieties, and plant tomatoes in a different part of the garden each year. Give tomatoes good air circulation and keep soil moist, but never soggy. Improper watering causes nutritional deficiencies that add to your yellowing leaves. Water in the mornings, so the leaves are dry by night. Remove diseased plants, leaves and plant parts from the garden as soon as symptoms hit. Dispose of the leaves -- don't compost them -- and always clean all tomato debris from the garden at year's end. Strong, healthy tomatoes resist diseases and insect pests, leaving attractive foliage and fruit for your table.